To tell the story of one person, we must tell you the story of three. The three include a brother named Jim Ed and his two sisters Maxine and Bonnie; also known as The Browns. Three different stories come together to create one. Nonetheless this is the story of one of the three. She was born Bonnie Jean Brown on July 31, 1938, in Sparkman, Arkansas. Music was always in her blood and part of her life as she watched her two older siblings (Maxine and Jim Ed) perform. Their parents owned a farm and their father also worked at a saw mill. At first it was just Jim Ed and his older sister Maxine, performing as a duo. The two earned national recognition and a guest spot on Ernest Tubb's radio show for their self-penned song "Looking Back To See." Then in 1955, their little sister Bonnie joined in. Just barely eighteen years old, Bonnie had recently graduated from High School. The addition of her vocal talents created a trio that was best known for their tight and pleasing harmonies. Together, they began performing on the ever popular show, The Louisiana Hayride in Shreveport, Louisiana. Their popularity on the show brought them to appear on KWTO in Springfield, Missouri. By the late 1955, they had earned another top ten hit with "Here Today and Gone Tomorrow." The song received a major boost as the trio appeared on the ever popular ABC-TV show Ozark Jubilee. In 1956, producer Si Siman signed The Browns to RCA Victor. Soon they earned two more hits with "I Take The Chance" and "I Heard The Bluebirds Sing." In 1957, Jim Ed was drafted in the United States Army. While on leave, the group would continue to record. During his service years, their other sister Norma filled in for him on tours. It wasn't until 1959, that The Browns scored their biggest hit, and signature song, with "The Three Bells." The song was based on a French song called "Les Trois Cloches" that was a hit for French singer Edith Piaf. The Brown's recording sold over one million copies and was nominated for both Record of The Year and The Best Group or Vocal Performance in the Grammy award categories in 1959. The song was also a big cross over hit as it hit the Pop and Rhythm and Blues charts. The exposure of that hit led to appearance on every major variety series of the day, including The Ed Sullivan Show and American Bandstand. Their success continued as they kept recording hits after hits. Hits that included "Scarlet Ribbons," The Old Lamplighter" and "Then I'll Stop Loving You." Each of their recordings included masterpieces that featured appealing, graceful, rich and warm harmonies. Bonnie was known for taking the high harmony parts. Bonnie was also known for her southern charm and grace. She turned the heads of many male entertainers of the time, including Elvis Presley. After several dates with Presley, Bonnie broke up with him claiming that he was a "lousy kisser." In 1963, The Browns were invited to join the cast of the Grand Ole Opry. With pride they gratefully accepted. Even though The Browns were still a touring favorite, they disbanded in 1967. They claimed that they had a desire to spend more time with their growing families. Jim Ed already had established himself as a solo artist and went on to have a notable career. Maxine also went on to a unknown solo career. It was Bonnie who returned home to her family. However, the trio did often reunite to perform on the Grand Ole Opry. Publicly they reunited twice, in the 1980's as well as in 2006, for a television special called Country Pop Legends. 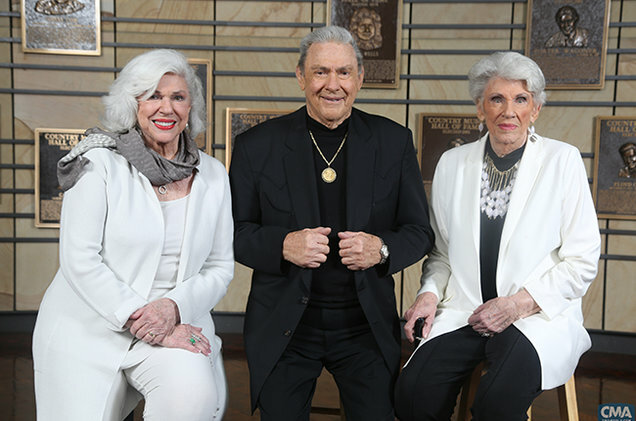 In March 2015, it was announced that The Browns were part of the new class of inductees into The Country Music Hall Of Fame. "When Bonnie Brown joined her brother, Jim Ed, and her sister, Maxine, in song, the siblings created an incomparable harmony: the smoothest and most elegant blend in country music." shares Country Music Hall Of Fame CEO Kyle Young. "Bonnie offered harmony offstage as well. She brought people together with regal grace and kindness. She lived a remarkable life, singing on grand stages, raising a beloved family, entering the Country Music Hall of Fame." Jim Ed passed away following his own battle with cancer prior to the official Medallion Ceremony that fall. Although he was presented with his medallion a few days prior to his passing. Not to long after the Hall of Fame announcement, Bonnie had officially announced that she too had been diagnosed with cancer. Bonnie was able to attend the Hall for the induction ceremony in October 2015. On July 16, 2016, fifteen days prior to her seventy-eighth birthday, Bonnie Brown Ring passed away at Baptist Hospital in Little Rock, Arkansas; due to complications of stage 4 adenocarcinoma right lung cancer. She is reunited with her husband of 56 years, Brownie Ring, and her brother Jim Ed. Bonnie Brown is survived by two daughters, Kelly (Ed) Bulleit and Robin (Rob) Shaver; Kelly's children Clark, Kendall and Raleigh; Robin's children Skylar and Stone, and sister Maxine. From 1955 through 1967, three stories became one beautiful and heart warming story called The Browns. Today, we honor that story as we celebrate their music. One story came to a close in 2015 and now another story closes today. Nonetheless this story will always remain to be told. As the music that was created will forever live and survive the test of time amongst the records that contain their tale that are waiting to be re-discovered. It's a story of three siblings called The Browns. Bonnie Brown with Jim Ed and Maxine.